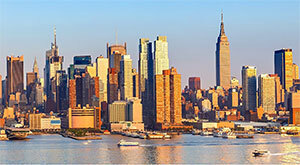 Click here to see the Economics and Business Educators 2019 Events Calendar (as at 6 February 2019). To apply to become a new member of EBE NSW, please visit the EBE NSW Membership Portal here. Click here for the "Benefits of EBE NSW Membership" flyer. Educating the next wave of entrepreneurs by unlocking economics, business and legal minds. The topic for this event is , Economics and schools - The future of wellbeing. It will offer students an update on Australian economic conditions now and in the year ahead, aligned to the HSC curriculum and led by a senior Reserve Bank official. The event is intended for students in years 10, 11 and 12. The event is open to teachers and students from all schools. >> See event details, program and registration details here. EBE NSW is excited to be running its annual Economics Update Conference on Friday 30 August 2019. Sponsored by CPA Australia, this course will provide Economics teachers with up to date information and statistics. Each session has been specifically linked to syllabus content. This event will be hosted at CPA Australia’s Sydney office in Harrington St, Sydney (5 minute walk from Circular Quay Railway Station). Morning Tea and Lunch will be provided. There are discounts for EBE NSW members. Rural EBE NSW members are invited to apply for a professional learning grant - more information is available on the conference program. The Reserve Bank's third Teacher Immersion Event will be held on Friday, 21 June 2019. This event provides an excellent opportunity for secondary school Economics teachers from across Australia to expand their knowledge of current economic issues and deepen their understanding of economic concepts. The event is also an opportunity for teachers to engage in professional discussions with their peers and practicing economists, including the Bank's Ambassadors. This one-day NESA-registered professional learning event is limited to 60 teachers, and is typically oversubscribed. For teachers unable to attend, the event will be recorded and made available on the Bank's website. The Reserve Bank recognises the need to attract a diverse body of students to economics. To support teachers from a variety of school types and from across Australia, a limited number of rooms have been reserved for attendees from interstate and regional New South Wales to stay at the Bank's H.C. Coombs Centre. Please express your interest in staying at the Centre when registering for the event (a small fee applies). Expressions of interest will be open from Monday 8 April 2019 until Monday 22 April 2019. >> Resources from past RBA Teacher Immersion Events are availble here. UTS Business School is hosting a series of workshops designed for year 11 and 12 students studying Economics and/or Business Studies on Wednesday 24 April 2019 from 1.15pm - 5.30pm. Developed in consultation with leading high school economics and business studies teachers from across NSW, each 1-hour session will be delivered by an expert in their field. Following the conclusion of the workshop, UTS Business School will be hosting its Undergraduate Information Evening where you can explore the university's Business, Economics, Management and Accounting options. 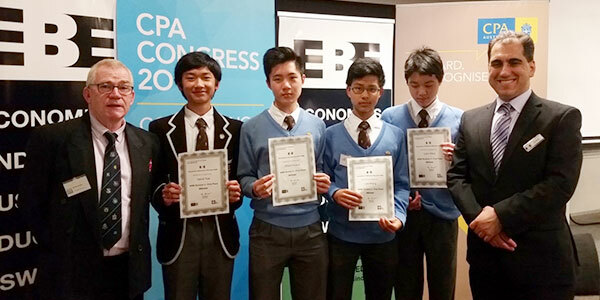 The Business Educators Australasia Plan Your Own Enterprise Competition (PYOE) encourages secondary school students to apply their business education to a real life scenario. Working individually or in small groups, participants are asked to devise a creative enterprise idea and submit a business plan, explaining how their great idea could become a profitable business. For teachers, the competition is a valuable tool to enhance the business education curriculum and support them as they develop the next generation of business leaders For students, it helps to build valuable work and life skills. The competition requires business insight, practical financial skills and a creative flair for problem solving. Division one – Open to individual student entries, submitted by students of any age, attending a registered secondary school. Division two – Group entries (maximum of six students), submitted by students of any age, attending a registered secondary school. NSW entries are due by Thursday 30 August 2019 (Term 3, Week 6) by 5pm. These will be marked, and finalists in both divisions will be invited to the NSW Awards Ceremony. At this awards ceremony, the winner in each division will be announced. The NSW Division One winner will receive an iPad mini 4 Wi-Fi 128GB (valued at $579). Certificates and other prizes will also be awarded. National judging will be based on the paper entry and will be conducted in October, 2019. Winners will be advised by end of October 2019. This competition can be incorporated into assessment tasks for both Commerce (Option 11: Running a Business) and Year 11 Business Studies (Topic: Business planning). Click here for a sample assessment task. Email EBE NSW if you would like a Microsoft Word version of the sample assessment task. Amanda Ritter has developed a unit of work based on the PYOE Competition which can be accessed here. The PYOE Competition could form the content for a Commerce "school - developed option" (see pages 48 and 49 in the NSW Education Standards Authority Commerce Year 7 - 10 Syllabus). All students who enter the competition will receive a Certificate of Participation for their job portfolios. >> Full details are available in the 2019 PYOE competition brochure. 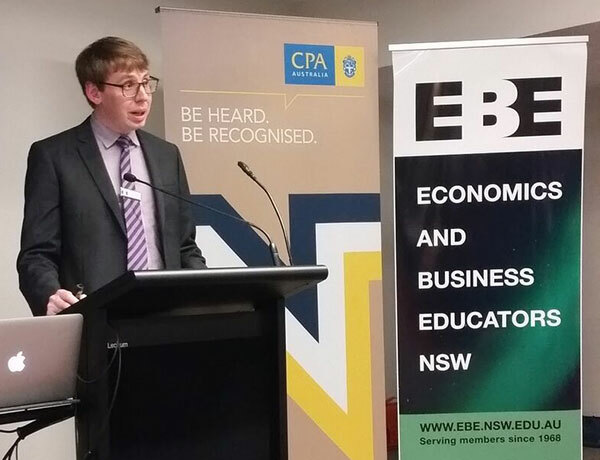 See the article available to EBE NSW members - “Student2Student: How to Overcome the Pitfalls of Business Planning" by Sarah Matthias (Division 1 Winner of CPA Australia Plan Your Own Enterprise Competition 2016) in “The EBE Journal – Journal of the Economics and Business Educators NSW” – Issue 2, 2016. While you teach your students about investing and the Sharemarket, they can put into practice what they are learning by playing the Sharemarket Game. Students receive a virtual $50,000 they can invest over a 10 week period, in 200 companies listed on the ASX. The prices students buy and sell at are the same prices as they would get in the live market so this is as close to real life share trading as you can get. Develop their knowledge of the sharemarket. Learn how to research companies. Discover the importance of wise investment decisions. Gain a greater knowledge of economic and world events. Begin to learn more about investing which is beneficial for their future. 2019 Game 1 begins on 7 March 2019 and ends on 15 May 2019. There are reports about past winners (including strategies they used when playing the game) in past editions of The EBE Journal - Journal of the Economics and Business Educators NSW. Economics and Business Educators NSW members can access the journals through the members section of the EBE NSW website. The NSW Premier's Teacher Scholarships provide $10,000 or $15,000 for a five-week study tour within Australia or overseas. The scholarships, funded by corporate supporters and private foundations, are open to teachers in NSW government and non-government schools, TAFE NSW campuses and early childhood centres. Scholarships are awarded in the year prior to the study tour. The majority of scholarships are for school-based teachers to explore best practice in their chosen subject area. The program aims to deliver significant outcomes for scholarship recipients, students, teacher colleagues and school communities. The NSW Premier’s Teacher Scholarships program is an initiative of the NSW Department of Premier and Cabinet and administered by the NSW Department of Education. Applications for the 2019 NSW Premier's Teachers Scholarships close on 28 April 2019. >> More information including past scholarship reports. On 13 May 2018, the NSW Premier Gladys Berejiklian and Minister for Education Rob Stokes announced that NESA (NSW Education Standards Authority) will undertake a review of the NSW curriculum to ensure it equips students to continue to contribute to Australian society into the 21st century. NESA has engaged Professor Geoff Masters, CEO of the Australian Council for Educational Research (ACER) to lead the review. >> EBE NSW has made a submission to the Review. Read the submission here. EBE NSW has made a submission to the NSW Education Standards Authority (NESA) re the 2018 NESA Draft Commerce Syllabus. >> Read the submission here. The current Commerce syllabus was last revised in 2003. The NSW Education Standards Authority (NESA) has released a draft Commerce syllabus. Have your say on the draft Commerce syllabus by completing a survey, attending a consultation meeting, and/or submitting a written response to the project manager. Consultation will be open from 23 July 2018 to 2 September 2018. Economics and Business Educators NSW will be making a submission about the draft Commerce syllabus and members are encouraged to contribute to the submission by sending their comments about the draft Commerce syllabus to admin@ebe.nsw.edu.au. What are the strengths of the syllabus? What are the challenges of the syllabus? Is there enough balance between economics, business, law, consumer and financial literacy and civics and citizenship subject matter? Considering the Commerce syllabus was last revised in 2003, to what extent is the current syllabus relevant to today's changing commercial environment and contemporary teaching and learning ? What do you think about the content from the Australian Curriculum, Assessment and Reporting Authority (ACARA) Australian Curriculum: Economics and Business and the ACARA Australian Curriculum:Civics and Citizenship to develop the draft Commerce syllabus? The Reserve Bank of Australia (RBA) also made a submission during this period – read their submission here. In response to the draft Commerce syllabus, the RBA has made a “Supplementary submission to NESA Review of Commerce Years 7 – 10 Syllabus”. Academy Travel, in conjunction with Economics and Business Educators NSW, is delighted to present an outstanding professional development opportunity for teachers of Economics, Business Studies, Legal Studies and Commerce. The order form for the 2019 EBE NSW Trial HSC Business Studies, Economics and Legal Studies examination papers is now available. Relevant past papers are also available for purchase. The examination papers have been designed by EBE Directors and include marking guidelines. Special discount prices apply to members of EBE NSW. Click here for the 2018 HSC Study Guide from The Sydney Morning Herald, including study tips for the NSW Education Standards Authority (NESA) HSC Economics, Business Studies and Legal Studies examinations. View the video, "Make the right choice in your Business Studies exam", presented by EBE NSW Vice-President Mai Ni Pham, where four tips for writing an extended response in Section IV of the NESA HSC Business Studies examination are discussed. The latest issue of The EBE Journal - Journal of the Economics and Business Educators NSW (Issue 2 — 2017) is now available in the members section of the website. EBE members must login to access the latest EBE Journal. Past issues of "The EBE Journal" are also in the members section. 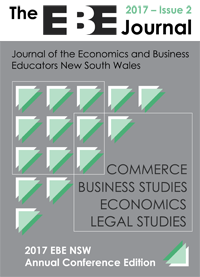 Back issues of the "The EBE Journal - Journal of the Economics and Business Educators NSW" are also available in the members section of this website and contain useful teaching and learning resources. EBE NSW congratulates all the recipients of the 2017 Professional Teachers' Council NSW Outstanding Professional Service Awards and the 2017 Professional Teachers' Council NSW Outstanding Beginning Teacher Awards. Congratulations to EBE NSW Director Nicholas Ward who has received a 2017 Professional Teachers' Council NSW Outstanding Beginning Teacher Award. Compass: The Staffroom - Part 1, Part 2 and and Part 3 (ABC Television) has received the 2017 Professional Teachers' Council NSW Media Award. >> Full details in the Professional Teachers' Council NSW Media Release - Celebration of Excellence (27 October 2017) which can be accessed here. Thank you to all the students who entered the competition this year and the teachers who inspired and encouraged their students to enter this prestigious competition. 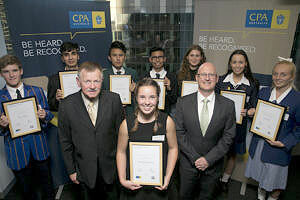 Each student who participated received a Certificate of Participation signed by Mr Jim Dickson FCPA, Director CPA Australia and Mr Tony Kuc, President Business Educators Australasia. Thank you to the students, their families and teachers for attending the presentation at the CPA Sydney Head Office. Thank you to EBE NSW Director, Nicholas Ward, for taking on the role of PYOE NSW in 2017 and for all his time and effort in ensuring the competition in NSW was a success. Congratulations to all the winners. Be sure to incorporate the PYOE competition into your Commerce and/or Business Studies teaching and learning program in 2018. 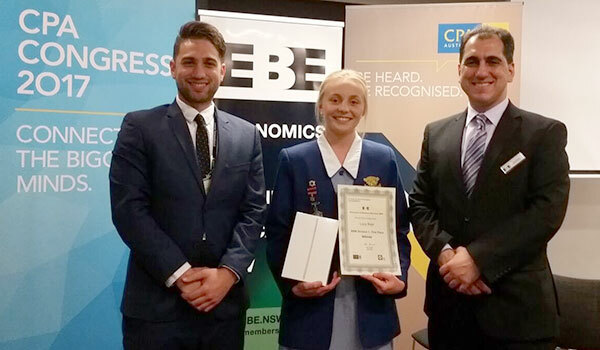 The Plan Your Own Enterprise Competition NSW Division 1 winner, Lucy Beer, represented NSW at the national PYOE awards ceremony in Melbourne on 10 October 2017 held by Business Educators Australasia. Lucy was flown to Melbourne for the national awards ceremony and joined the division one finalists from the other states and territories of Australia. Unfortunately Lucy did not achieve the national Division 1 (individual) winner. However reaching the national final is a significant achievement. The national Division 1 winner was Jessica Lauc from Merici College (Australian Capital Territory) for her business plan, “Leadz”. The national Divison 2 (group entry) winners at the national level were Elise Atkins, Jack Bellinger, Ashley Chamberlin, Jacob Holm and Connor McLean from Hopetoun P-12 College – Victoria for their business plan, MSR- Mallee Sports and Rec. EBE NSW congratulates the 2017 PYOE national winners.